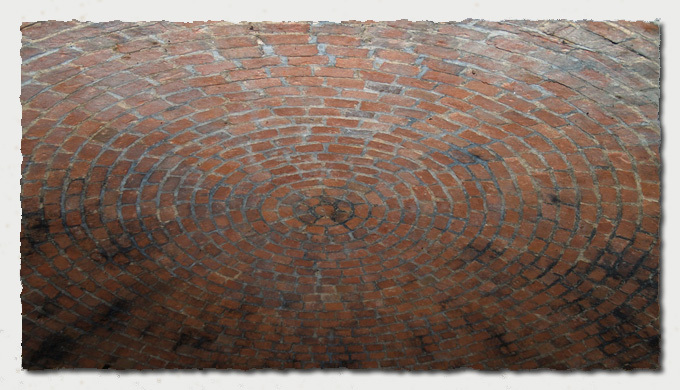 The header picture is a view of the magnificent brickwork which makes up the domed roof of the ice house. 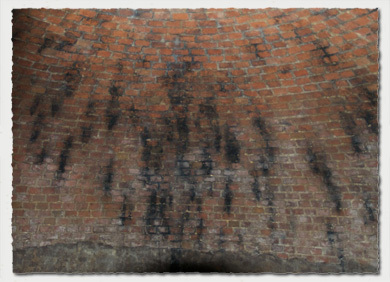 The interior is generally dry, although a certain amount of water seepage can be seen by the stains on the brickwork, also some rainwater enters through the small entrance. The lower walls are rendered, the point where the render ceases can be seen in the picture below running along the bottom of the image at the start of the change in direction of the brickwork from the wall to the roof. The pictures on this page were taken by precariously poking my Olympus DSLR through the steel bar grill over the entrance, the shot below, still not perfect and taken without the flash, gives a better view of the vast interior. Research about ice houses has led me to the conclusion that the Parlington structure is quite large as ice houses go, one of the earliest recorded icehouses in Greenwich, London [around early 1600's], was of a similar size, being a bricked out well, around 30 feet deep and 16 feet across. Some ice houses were built with a cavity wall construction. This did not necessarily include the domed roof, as that would be more difficult to construct with a void between the two skins. 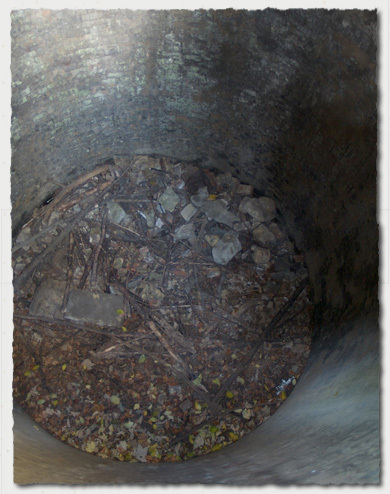 In any event the two skins would be tied together at intervals with bridging masonry to provide strength, as to whether this construction was used on the Parlington Ice House is unknown, but looking at the entrance, which is in the upper domed section this is only a single skin. The walls are in English Garden Wall Bond, a row of headers followed by three rows of stretcher bricks, this means it is at least 9 inches [One Brick] thick. The subject is covered on the earlier site and is available on the link below.